Everybody's heard the old saying, "It's better to give than to receive." I'd argue that it's even better to give and receive, and now it's possible by using a little-known tip that can help Canadians get back up to 78 cents for every dollar you donate to charity. A lot of people love to give to not-for-profits during the holidays, which is great. As somebody with the privilege of financial freedom, it's an honour to be able to invest in causes that are important to me. On the other hand, as a stone cold capitalist, I'm morally obligated to make the most of every dollar I spend or donate...and lucky for you, Uncle Kevin's here to help you do the same. Next time you're about to hand a $20 bill to the little girl canvassing outside of the local mall, I want you to consider the fact that it's possible give her the same amount of money while getting more than half of it back. How? By taking advantage of Canada's First-Time Donor's Super Credit (FTDSC) next time you file your income taxes. Many Canadians don't realize that for every dollar they donate to a registered charity, they're eligible to keep 19 to 53 cents. And now, thanks to the FTDSC initiative, first time donors can save an extra 25 cents for a total of 44 cents to 78 cents per dollar. It might not sound like a lot, but anyone who's ever had a piggy bank knows that a few handfuls of dimes and quarters add up very fast. Let's back track to that little girl collecting donations for charity in the mall parking lot. You could give her the same $20 and receive about $10 to $15 back on your next tax return depending on your province. Or if you're feeling exceptionally generous, give $1000 and receive between $609 and $743! Not sure if you're eligible for the First Time Donor's Super Credit? If you haven't claimed a tax credit for a charity donation since 2007, you qualify. Just choose your registered charity, make a donation up to $1000, give your receipt to your accountant and enjoy your savings. 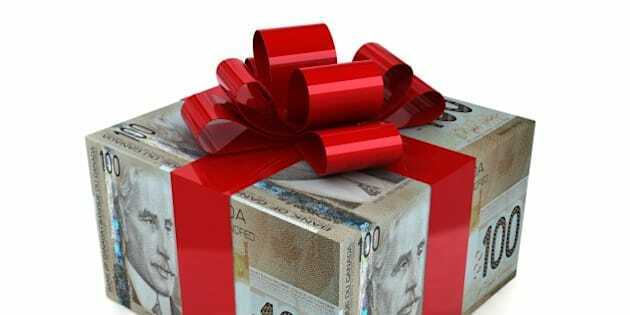 This holiday season, instead of handing your loved one a cheque and advising them "not to spend it all in one place," why not encourage them to make a donation to a meaningful charity and reap the benefits of the First Time Donor's Super Credit on their next tax return? You'll be teaching them a valuable lesson about giving back, while saving them money down the road and educating them about Canada's tax system. If you're not sure what charity to donate to, CharityIntelligence.ca rates organizations based on their transparency and accountability, need for funding, and cost efficiency so that you can be confident about where your money's going.